One Of A Kind Nakashima Style Furniture In Stock. Have A Nakashima Style Piece Custom Made Just For You. Our Nakashima style furniture is handmade from reclaimed and recycled Walnut, Cherry, Bubinga, Maple, Oak and many other beautiful woods. These are unique, unusual, and artistic Nakashima style furniture pieces custom made to order!!! 8 foot Nakashima style desk built with a large Bubinga slab top. 6 feet long and 31″ wide single piece Walnut Burl slab with a simple walnut base handcrafted. Custom Nakashima style furniture and slab tables made to order. This unusually shaped Nakashima style desk is a one of a kind. This natural edge round custom claro walnut table has some amazing swirling figure. This is a one of a kind piece about 4′ across. SOLD – But can make another that is similar. This custom walnut Nakashima style executive desk is SOLD but I built another with some other crotch walnut slabs I have in stock. The “Binder” walnut slab custom made dining room table with burled maple base. This custom maple crotch desk has the most amazing figure I have ever seen. SOLD – BUT HAVE ANOTHER SIMILAR FOR SALE NOW! 10′ Modular 2 Piece Maple Slab Custom Made Dining Room Table With Walnut Pedestal Bases. SOLD – But can make another! Large 10′ burled maple slab table on display in a NYC showroom.This table has a twin steel I-beam base. 79″ x 43″ Book matched Figured Claro Walnut Slab Custom Nakashima Style Dining Table with Hand Turned Walnut Spindle Legs. Available For Sale Now! 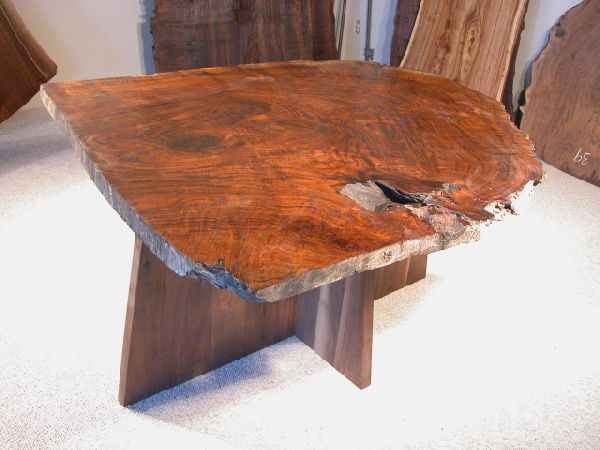 15.5′ custom Ginko slab dining table with organic crotch shape. It is about 5′ wide at the crotch and 3.5′ at the narrow end. This custom walnut crotch top came from a tree just outside NYC. This custom dining table now lives in Pennsylvania but could make another similar table. This irregular shaped thick custom walnut desk is a one of a kind, unusual and artistic piece. This custom desk has unusual color and shape. This custom walnut desk is simple and sleek. Seats 16-20 people! Custom dining tables made from walnut, cherry, maple and more. Unique Nakashima style Ash and Cherry rustic slab desk. This desk has been sold but could make another that is similar. Nakashima style Walnut and Cherry slab bench made with a hand carved seat. This bench has sold but could make another similar bench. Walnut Crotch Slab Custom Table or Desk with Solid Slab Ends. 7′ x 29/39″ Wide. 7 foot burled Maple slab desk. This desk has sold but could make another similar desk.